There is no app out there today like Conversation Builder for practicing conversational turns. Winner of two awards, the Geek SLP Seal of Approval and the 2nd Best Educational App by Smart Apps for Kids, Conversation Builder uses real life, conversation-inducing photos of children in various situations; which are the closest to the real thing! Great for preparing students for taking turns in conversation, this app allows children to record and play back their own speech in conversation. Continue reading for my review of Conversation Builder! The initial page that you will see is the Settings page; however, if you look at the bottom of the screen, you will find four different tabs with an icon for each. The Info tab (with an icon of a lower case “i” with a circle around it), when pressed, brings you to the developers’ information about the application as well as their interpretation of how the application should be used. 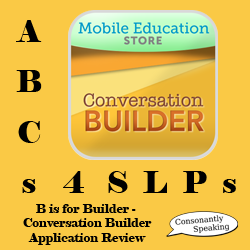 The Mobile Education Store states that Conversation Builder is designed for elementary-aged children to learn how to have conversations with multiple turns in multiple social settings. The Settings tab (with an icon of a file cabinet), when pressed, shows you choices for various settings in the application. These settings include the student’s profile, level of play, conversation initiator, modules, and randomization. The Play tab (with an icon of a running man), opens the conversation building activity itself. Finally, the Archive tab allows you to listen to saved audio files of students’ conversations. More detail on each of these tabs will follow. When you click on the “Create Profile” button, you will be able to create a profile for your student. This allows you to complete forms for the student which include their first and last name, age, interest, and city. These forms are all required to fill in because they will be used to personalize the students’ conversation experience. When you click on the form, the keyboard will appear at the bottom of the iPad. Once you type information in each form, these words will carry over throughout the app. Multiple names can be stored in the application. The iPod/iPhone version of the app does not allow for student conversations to be archived, but the iPad edition allows for audio files to be archived by student. 1 on 1 – 4 Exchange: The student has 4 conversational exchanges with the peer’s voice on the app accompanied by a related picture. The student speaks twice and the “peer” speaks twice, in a turn taking fashion. 1 on 1 – 8 Exchange: The student has 8 conversational exchanges with the peer’s voice on the app accompanied by a related picture. The student speaks four times and the “peer” speaks four times, in a turn taking fashion. Group – 4 Exchange: Each student takes turns having conversational exchanges with a real-life peer/peer(s) accompanied by a related picture. Each student takes at least one conversational turn. The Conversation Initiator setting allows you to choose who will initiate each conversation. There are three buttons on a tab bar to choose from labeled “Student”, “Peer”, and “Random”. Choosing the “Student” as the conversation initiator means that the student will go first and initiate the conversation with the “peer’s” voice on the app. In the app play, the student is then cued by a male voice stating “How would you start this conversation?” followed by three choices. If you choose the “Peer” setting, the “peer” voice will ask a question or state a comment related to a picture followed by the narrator asking “what would you say next?” Then, three choices will appear to assist the student in replying to the “peer’s” statement. When “Random” is chosen, the initiator of the conversation will be random with each new picture. The setting “Randomize All Available Conversations” has an on-off toggle switch. Slide it to the left or right to randomize conversations within the app or not. After you choose which level of play and conversation initiator you want, it’s time to get started with the fun! If you chose the student to initiate the conversation first, a photo will appear upon selecting the Play tab and the narrator will state “How would you start this conversation?” Three different sentence replies will appear as buttons at the top of the page. If you want to skip the particular image/conversation, you can select the “Skip Conversation” button at the bottom of the page. Upon selecting the incorrect answer, the narrator will provide positive constructive reinforcement by stating “that was an uncommon way to start the conversation” or “that’s not the best way to start this conversation, try again”. If you select the correct answer, the narrator will state, “that’s right, now let’s record it!” Then, press the “Record” button and have the student speak into the microphone. The correct answer will remain on the screen with the other two answers disappearing so that the student can read the correct answer aloud. Press “Stop Record” once the student has stated the correct sentence. You can play the recording for the student to hear by pressing the “Replay Recording” button. This way, they can evaluate whether or not their answer was appropriate or the same as the above answer. If the recording is not clear or incorrect, you can record over the previous audio file by pressing the “Record” button again. To move on to the next part of the conversation, click the “Next” button. You can also press “Play Last” to hear the peers’ response again. You can also see the text from the peer and the student by pressing “History. This will show a text message-like written history of each response in conversation to help cue the student of what to say next. When it is the “peer’s” turn, the pre-recorded voice of the “peer” matching the photo will play as the next step in the conversation. Once again, the male narrator returns and states, “What would you say next?” Then it is the students’ turn to select a correct answer again out of three, record their answer, and select the “Next” button. Finally, the “peer” will have a conversational turn again. If you had selected there to be 4 conversational exchanges, that conversation is done. If you chose 8 exchanges, there will be two more turns per person. The best part about this application is that you can listen to the entire conversational exchange by pressing “Play conversation”. By selecting the peer as the conversation initiator, an image will display and a voice of the “peer” will start playing. Then, as stated above, the narrator will say, “What would you say next?” afterwards. Then, select the correct answer out of three, record, and move on to the next conversational turn, and so on for as many conversational turns as selected on the Settings tab. The “Finish” button will appear once the conversation is finished. Press it to move on to the “Conversation Complete” screen where you can play the conversation, save it, e-mail it, or move on to the next conversation/image (more information to follow). The Group settings for this application are slightly different. You must have a group of the student and a peer/peer(s) or a student and an adult/adult(s) (or a combination). Enter in the names of who will be interacting with the student. You can also add a photo if you would like. In addition, it does not matter who is selected as the “Conversation Initiator” because it will start the same way with the same prompts each time. Select the person to begin the conversation by pressing his or her name and a check mark will appear. Then, press “Done” to begin the application play. As before, an image will appear and the narrator’s voice will state, “How would you start this conversation?” The main difference is that there are no textual choices to help the student start the conversation. Select the green “Record” button to have the student verbally record how he or she would start the conversation. If the student records an inappropriate or off-topic response, you can have the student re-record his or her statement by selecting the “Record” button again. If you would like to play back the recording, click the “Replay Recording” button. Otherwise, select the “Next” button to move on. The narrator will then state, “Now pass your iPad to a friend and let them record a response”. The response needs to be from the perspective of the person in the image or another bystander. Choose the student to respond again. Have the peer or adult (yourself or a different adult) press the “Record” button to record a response followed by “Next” to move on to another students’ or the previous students’ turn. You can also press “Play Last” to hear the previous persons’ recording. The narrator will again state, “Now pass your iPad to a friend and let them record a response.” The student must respond to the peer or adult by again pressing “Record” and “Next”. The narrator will state a third time, “Now pass your iPad to a friend and let them record a response” and so on until the conversation is closed. Once both the student and peer/peer(s) (within the application or real-life) are finished with the conversation, press the “Finish” button. You will then be able to press “Play” to hear all of the conversational exchanges recorded. For all of the conversational exchange options, at the end of each conversation, you will be able to save the conversation to the “Archive” for that student by pressing the “Save” button (on the iPad only). A menu will pop up stating to “Enter Name”. This is not pre-populated from the user profile, so click on the white form to enter the name of the student via the keyboard. Press “Save” to save the conversation to the “Archive”. Press the “Cancel” button if the “Save” button was pressed by accident or if you changed your mind about saving. Then, the “Save” button will disappear. You also have the option to share the conversation via e-mail by pressing the “Email” button. Make sure your e-mail is saved within the Mail app on your iPad. Finally, you can press “Next Conversation” for another image and conversation. Any previous conversation that you have chosen to save for a user will appear in the Archive tab of the application. When you are in a students’ profile, only the conversations saved for that student will appear in the Archive tab. To hear a previous conversation from this tab, select the conversation you wish to hear by clicking on an image/name underneath “All Conversations for (student name)”. Once you click on a conversation button, you will see a large image associated with the conversation on the left hand side. This way, you will be able to know if that is the conversation you would like to listen to. Click the “Play Conversation” button to hear the entire conversation. You can also delete all conversations on this menu. If you want to delete the conversation, select “Delete Conversation” underneath the photo or swipe your finger to the left over the conversations’ button and press the red “Delete” button. The application will prompt you asking if you are sure you want to delete the conversation, just in case you pressed the “Delete Conversation” button by accident. Click “Yes” to delete it or “Cancel” to keep it. You can e-mail the selected conversation by clicking the “Email Conversation” button. When you press the “Email Conversation” button, the Mail application will pop up. You can enter who you wish to send the file to and it will be attached as a Quicktime file. Once you have completed all of the information needed to send the file over e-mail, click “Send”. If you selected “Email Conversation” by accident or change your mind about e-mailing it, you can click the gray “Cancel” button to return to the Conversation Builder application. Make sure you select whether you would like to save the e-mail as a draft to work on later or to delete the draft itself. E-mailing a conversation on the iPod/iPhone version of the application is different because there is no option to save conversations to an Archive. Therefore, in order to send the audio file via e-mail, you must send the conversation you just recorded while still in Play mode. You have the option to e-mail the conversation once all conversational turns have been completed and you have pressed “Play Conversation”. Select the “Email” button prior to clicking the “Next Conversation” button or navigating anywhere else on the iPad. The e-mail form will pop up just like in the iPad version with the same options. Like the iPad version, it will be sent as a Quicktime file. In order to obtain an achievement certificate, a student must master all of the 8-turn exchange conversations for the image shown. Once a conversation has been mastered/completed/saved, the image will be colored and a certificate. Levels of Play – Some of my students are working on short conversational exchanges and others are working on lengthier ones. These options are great depending on the age and developmental level of the student. In addition, it is fun to have a normal developing peer/peer(s) come into the classroom and have a fun, recorded conversation with a student rather than having myself use the app with them all the time. Conversation Initiator – Once again, some of my students are working on initiating conversation and others are working on responding to peers. Some are working on both! That is why it is great to have the three different options of my student, a peer, or alternating conversation initiators. I love that there are pre-recorded messages of the “peer(s)” in the images for my students to practice with at school and at home! Real-life Photos – The use of photos from real-life instead of cartoons was a wise decision by Mobile Education for this app. This makes the conversation seem more real for my students and they can relate to the “peers” in the application much better. Recording Capability – To have students be able to record and play back conversations on an iPad feels like a thing of the future to me! Thank goodness it is not because I truly believe that this will help my students self-assess their conversations. It also allows me to play back the conversation, pause it to comment on an aspect of the conversation, and then continue to play the remainder. Archive – Being able to save multiple conversations my students have is great because I can then hear the progress from the beginning of the year to the end. In addition, I can play back saved conversations for parents at IEP meetings. Finally, I can send conversations over e-mail so that I can use them as a language sample for an IEP or send them to a parent so that they can hear their students’ progress in therapy at home. Available Modules – There are so many different conversation modules to use for various topics! Video Tutorial - This is great for parents because if they purchase the app at home and forget my tutorial, they can watch a tutorial of how to use the application online. New Update of "History" - A great visual for my students is to be able to read the previous statements in conversation. Also, the fact that they can listen to the previous audio, especially for non-readers, is perfect! New Update of "Import Photo" - The fact that you can import photos is amazing! This is helpful for students on the autism spectrum to be able to talk about certain topics/areas of need. I would love it if the application would read the conversation response choices aloud, prior to them chosing the correct answer, in order for my students so that the ones who cannot read yet may be able to select the correct choice. It would be great to be able to save conversations to an Archive on the iPod/iPhone version of the application. Sentence Expansion – If a student makes a conversational turn with a short response, ask them to add more information. Point out different topics of conversation the student could talk about. Discuss details about the background of the image, actions of the peer(s) in the image, and emotions of the peer. Add action words, adjectives, feelings, opinion, or prepositions to sentences. Inference/Prediction – Ask your student what he or she thinks will happen after the conversation ends. Problem Solving/Social Situation – If the image shows a peer who is upset or angry or if the peer’s audio states a problem, ask the student how they would handle the situation if it happened to them. Ask them how they would feel if they were in the same situation. Describing – Discuss the peer’s emotions, actions, clothing, setting, and other objects in the picture. Compare and contrast them to other peers, other settings, and other objects. Narrative – Have the student create a story about the image. They can even write it out! Articulation – Have the student use their best speech sounds when recording responses on the application. Listen back to the conversation to have the student assess their own speech. Conversation Builder is available for $7.99 for the iPod Touch/iPhone and $19.99 for the iPad. Now go spread some great conversation by getting the conversation started about Conversation Builder!